Native to China, where it has been cultivated for more than four thousand years, the lychee was considered to be the very finest fruit of the Celestial Empire. Sometimes also referred to as “the Chinese cherry”, it was traditionally offered as a gift by the emperor and has been celebrated by many poets. It is the fruit of Litchi chinensis, a tropical tree 5 to 10 m (and sometimes more than 15 m) tall. 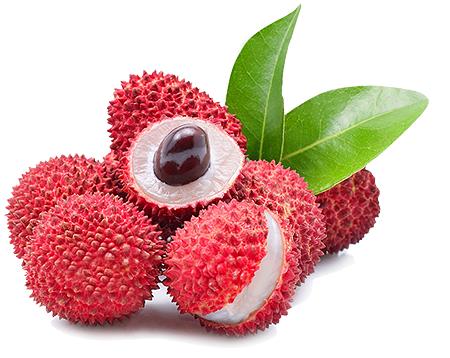 Lychee is a luscious fruit with intense aromas of rose and muscat. Its translucent and soft pulp, which envelops a stone, is protected by a bark of red colour at maturity. This spherical fruit weighs an average of 24 g.
Rich in carbohydrates, minerals and vitamins B and C, it contributes to general well-being. Our fruits come from the best orchards of Mauritius, selected for the quality of their soil. We attach great importance to the management of the orchards and to the moment of harvesting, which is at optimum maturity. To determine the date of harvest, we follow the evolution of acids and sugars in the pulp, while taking into consideration other criteria such as colour, appearance, firmness of the fruit and, of course, taste. Harvested fruits are sorted for a first time in the orchards. Only the best ones will be sent to the winery. Upon reaching the winery, the lychees are placed on a sorting table and subjected to a second selection. Each fruit is peeled by hand — a rigorous and uncompromising step to obtain quality wines. The fruits are then pumped into thermo-regulated tanks where alcoholic fermentation is induced by specific yeast strains.